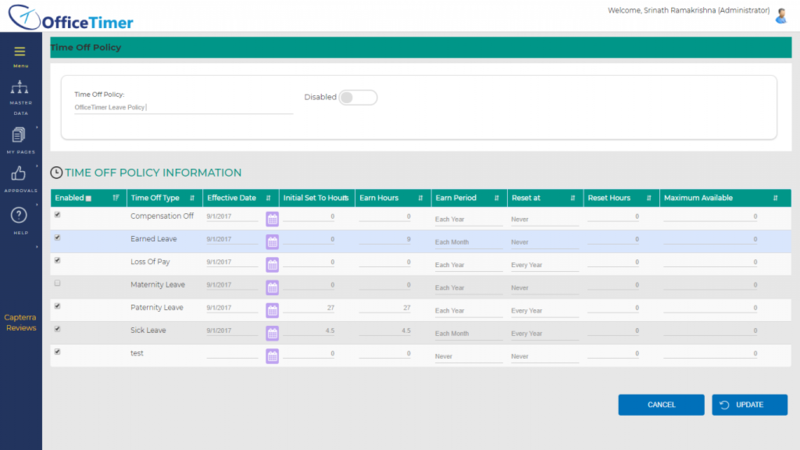 Using Time Off feature, employees can check available time off, make a request, get manager approval. OfficeTimer time off and absence management provides a comprehensive time off and absence management solution unmatched in the industry today. Time off requests, approvals and scheduling. Users can see how much time off is entitled and request time off accordingly. Automated n otifications: requests, approvals, rejections, approver notices. Set up accrual rules that are automatically applied. Multiple holiday schedules by country, country groups, or locales. Approvers can approve time off based on how much is entitled and how much has been requested. If request is required for[Time Off Type],you must submit[Time Off Request]for a time off type using the[My Time Off]page. Booked time off will automatically display in your timesheet. User can see all[Time Off Types]balances while submitting[Time Off Request]. Administrator can check the Time Off status of each employee by clicking on[Time Off]link on “Employee” page.